Maple Leaf Monster Jam Rolls Into Toronto January 18-19 2014! It's almost that time of year again, when Maple Leaf Monster Jam tears through the Roger's Centre in Toronto, crushes some serious metal, and revs up your eardrums! Last year was the first time I took my family of 7 to see Monster Jam 2013, and let me tell you it was an amazing spectacle to behold! We witnessed cars getting crushed, monster trucks flipping upside-down and catching on fire, giant monster truck wheels rolling off, and most spectacularly, monster trucks defying gravity and catching some serious air! My family was dumbfounded by the Maple Leaf Monster Jam show, and if you have sons or grandsons (or little girls who love cars and deafening engine noise), then you MUST take them to see the show! Stepping into the Roger's Centre arena was 100% testosterone, octane, and large-scale demolitions. It was like Smash Up Derby meets reality tv. It brings out the primal love of engines, awesome vehicles, competition, destruction and ear-popping sound that seem to go hand-in-hand with being a boy aged 4-years old to 104-years old! Important note: Do bring heavy duty ear protection for the whole family when visiting the show. The noise is deafening and likely something that your eardrums have never encountered. Cotton balls will not cut it. Ear plugs are $1 in the Dollar Store, or $25 at the Monster Jam venue. Purchase the "earphone" type for best protection. We're talking 140-decibel sounds like a jet engine at take-off! See Cam McQueen Bustin' It Up In Northern Nightmare! "Maple Leaf Monster Jam stars the biggest performers on four wheels: Monster Jam monster trucks! The twelve-feet-tall, ten-thousand-pound machines will bring you to your feet, racing and ripping up a custom-designed track full of obstacles to soar over or smash through! Monster Jam provides a massive night's entertainment tailored perfectly for your family's budget, and these colorful, larger-than-life beasts are sure to capture the hearts of both young and old!" Check out the Monster Jam calendar for both Canada and the USA here. It shows the dates that Monster Jam will be in your city! 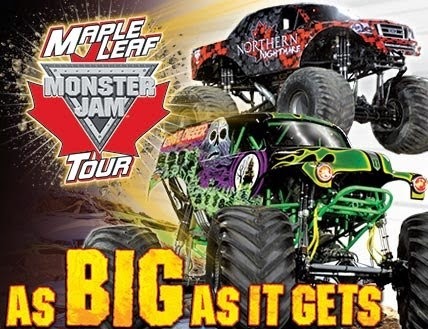 Use Discount Code MUM4 to receive $4 off per Maple Leaf Monster Jam ticket on BOTH shows. Excludes Front Row, Gold Circle, TAP, and VIP tickets. No double discounts. Additional Fees May Apply. Weekday is defined as Monday through Thursday. Weekend is defined as Friday through Sunday. Limit of four (4) per purchase. Buy Maple Leaf Monster Jam Tickets! Follow Monster Jam on Social Media! WIN Family Tickets (for 4 family members) to see Maple Leaf Monster Jam in Toronto on Saturday January 18th, 2014 at 7:00pm at the Roger's Centre in Toronto! Contest open to Canada (or contestants willing to get themselves to Toronto). Leave a COMMENT below stating if you've ever attended Maple Leaf Monster Jam before OR what do you think would be your child's or grandchild's biggest thrill about seeing the Maple Leaf Monster Jam show. Then use the entry form below to enter the contest. GOOD LUCK! My son would love to win this. He went last year for the first time and loved meeting the drivers and the trucks. He loved the crashes as well. We went last year in London. My son loves when they drive on top of the cars. I have never been to a MonsterJam show. I would like to give this to my nephews. I think they would have a great time. Ive never seen it live but i have watched it on tv many times with my son and nephew. My brother takes his family every year. I have never seen it live. I have watched many times on tv with my son and nephew. Ive never attended but would love to. Unfortunatly I am not in Toronto so I will have to wait till they come closer to mel. I would love to feel and hear the enthusiasm of the crowd and the monster trucks. We've never been, but I know my Son would love this! Our kids would love to cheer on Grave Digger - their absolute favourite! We've been before as a family and we all LOVED it. I've never attended but it seems like tons of fun for the family. We went last year and my son still talks about how cool it was to see the 'real' Grave Digger! Last thing my husband did before he died. I would love to take our youngest to something my husband loved.! I'm so sorry for your loss, Jewelz. Good luck in the contest! I have been taking my son to monster jam every year for five years now. He LOVES monster trucks, and everything else that is motorized!! Maple Leaf Monster Jam Crushes Toronto! PROMO Code & CONTEST! Really Great Contest. Check toronto airport limo service. Never been before, but I think my son would love it! I have never been able to go before always wanted to! Would be great to win this as it's on my Husbands birthday!! Thanks so much for the chance good luck everyone!! Been to a couple shows in the past and loved every one of them. I want to get the package so I can take my little cousin Jayden as he has never seen his favourite truck "Monster Mutt Dalmation" in person before. 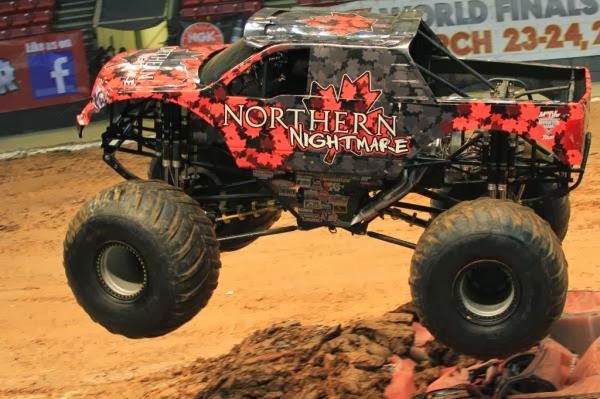 We have never been to a Maple Leaf Monster Jam before but it looks like a lot of fun! The thrill watching my son experience the Monster Trucks, especially his favourites (Grave Digger, Man of Steel) in person and larger than life would be an awesome start to our New Year! We have been talking about going top this since he was three and five years later, I think it's time!